WARNING: This medication may cause a condition known as tardive dyskinesia. In some cases, this condition may be permanent. Tardive dyskinesia is more likely to occur when metoclopramide is used for longer than 3 months, in high doses, or when used in the elderly (especially elderly women). Contact your doctor immediately if you develop any unusual uncontrolled movements (especially of the face, mouth, tongue, arms or legs). There is no treatment for tardive dyskinesia, but in some cases symptoms may lessen or stop once metoclopramide is stopped. 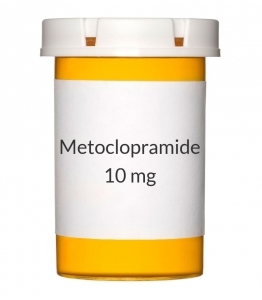 Because of the risk for tardive dyskinesia, metoclopramide should not be used for longer than 3 months (12 weeks), except in rare cases where the benefits of this drug outweigh the risk of developing tardive dyskinesia. Discuss the risks and benefits with your doctor. USES: This medication is used to treat certain conditions of the stomach and intestines. Metoclopramide is used as a short-term treatment (4 to 12 weeks) for persistent heartburn when the usual medicines do not work well enough. It is used mostly for heartburn that occurs after a meal or during the daytime. Treating persistent heartburn can decrease the damage done by stomach acid to the swallowing tube (esophagus) and help healing. Metoclopramide is also used in diabetic patients who have poor emptying of their stomachs (gastroparesis). Treating gastroparesis can decrease symptoms of nausea, vomiting, and stomach/abdominal fullness. Metoclopramide works by blocking a natural substance (dopamine). It speeds up stomach emptying and movement of the upper intestines. OTHER USES: This section contains uses of this drug that are not listed in the approved professional labeling for the drug but that may be prescribed by your health care professional. Use this drug for a condition that is listed in this section only if it has been so prescribed by your health care professional. This drug may also be used to prevent nausea/vomiting from chemotherapy or radiation treatments for cancer. HOW TO USE: See also Warning section. Read the Medication Guide provided by your pharmacist before you start taking metoclopramide and each time you get a refill. If you have any questions, consult your doctor or pharmacist. Take this medication by mouth 30 minutes before meals and at bedtime, usually 4 times daily or exactly as directed by your doctor. If you are using the liquid form of this medication, carefully measure the dose using a special measuring device/spoon. Do not use a household spoon because you may not get the correct dose. If you are using the disintegrating tablet, do not remove the tablet from the blister pack until right before your dose. Dry your hands before using this medication. Do not use the tablet if it is broken or crumbled. Immediately after removing the tablet, place it on the tongue. Allow it to dissolve completely, then swallow it with saliva. You do not need to take this product with water. Dosage is based on your weight, medical condition, and response to treatment. If heartburn only occurs at certain times (such as after the evening meal), your doctor may direct you to take a single dose before those times instead of taking it throughout the day. This will reduce your risk of side effects. Because of the risk of tardive dyskinesia, do not take this more often, in larger doses, or for longer than directed by your doctor. According to the manufacturer, treatment should not exceed 12 weeks. To treat diabetic gastroparesis, this medication is usually taken for 2 to 8 weeks until your gut is working well. This condition may recur from time to time. Your doctor may direct you to start taking this medication as soon as your symptoms reappear and stop when you feel better. Ask your doctor for directions for starting and stopping this medication. Take this medication regularly as directed to get the most benefit from it. To help you remember, take it at the same times before a meal each day. If this medication has been used regularly for a long time or in high doses, withdrawal symptoms (such as dizziness, nervousness, headaches) may occur if you suddenly stop using this medication. To prevent withdrawal reactions, your doctor may reduce your dose gradually. Consult your doctor or pharmacist for more details, and report any withdrawal reactions immediately. Tell your doctor if your condition persists or worsens. SIDE EFFECTS: See also Warning section. Drowsiness, dizziness, tiredness, trouble sleeping, agitation, headache, and diarrhea may occur. If any of these effects persist or worsen, tell your doctor or pharmacist promptly. Remember that your doctor has prescribed this medication because he or she has judged that the benefit to you is greater than the risk of side effects. Many people using this medication do not have serious side effects. Tell your doctor immediately if any of these unlikely but serious side effects occur: mental/mood changes (such as anxiety, confusion, depression, thoughts of suicide), decreased sexual ability, inability to keep still/need to pace, muscle spasms/uncontrolled muscle movements (such as twisting neck, arching back), abnormal breast-milk production, enlarged/tender breasts, swelling of the hands/feet, changes in menstruation in women. This medication may cause side effects that look like Parkinson's disease. Tell your doctor immediately if any of these unlikely side effects occur: shaking (tremors), slowed/difficult movement, muscle stiffness, mask-like facial expression. This drug may infrequently cause a serious (sometimes fatal) nervous system problem (neuroleptic malignant syndrome). Seek immediate medical attention if you notice any of the following rare but very serious side effects: fever, rigid muscles, increased sweating, fast heartbeat, confusion. A very serious allergic reaction to this drug is rare. However, seek immediate medical attention if you notice any symptoms of a serious allergic reaction, including: rash, itching/swelling (especially of the face/tongue/throat), severe dizziness, trouble breathing. This is not a complete list of possible side effects. If you notice other effects not listed above, contact your doctor or pharmacist. In the US - Call your doctor for medical advice about side effects. You may report side effects to FDA at 1-800-FDA-1088. In Canada - Call your doctor for medical advice about side effects. You may report side effects to Health Canada at 1-866-234-2345. PRECAUTIONS: Before taking metoclopramide, tell your doctor or pharmacist if you are allergic to it; or if you have any other allergies. This product may contain inactive ingredients, which can cause allergic reactions or other problems. Talk to your pharmacist for more details. Before taking this medication, tell your doctor or pharmacist your medical history, especially of: bleeding/blockage/hole in the intestines/stomach, breast cancer, diabetes, high blood pressure, kidney problems, heart failure, mental/mood problems (such as depression, thoughts of suicide), Parkinson's disease, liver problems (such as cirrhosis, porphyria), pheochromocytoma, seizures, a certain blood enzyme problem (NADH-cytochrome b5 reductase deficiency). This drug may make you dizzy or drowsy. Do not drive, use machinery, or do any activity that requires alertness until you are sure you can perform such activities safely. Limit alcoholic beverages. Liquid products may contain alcohol. Caution is advised if you have diabetes, alcohol dependence, liver disease, or any other condition that requires you to limit alcohol. Ask your doctor or pharmacist about using this product safely. Before having surgery, tell your doctor or dentist about all the products you use (including prescription drugs, nonprescription drugs, and herbal products). If you have diabetes, this product may make it harder to control your blood sugar levels. Check your blood sugar levels regularly as directed by your doctor. Tell your doctor immediately if you have high or low blood sugar. Your doctor may need to adjust your diabetes medication, exercise program, or diet. Children may be more sensitive to the side effects of this drug, especially muscle spasms. Older adults may be more sensitive to the effects of this drug, especially drowsiness, tardive dyskinesia, and Parkinson's type muscle problems. During pregnancy, this medication should be used only when clearly needed. Discuss the risks and benefits with your doctor. This drug passes into breast milk and may have undesirable effects on a nursing infant. Discuss the risks and benefits with your doctor before breast-feeding. DRUG INTERACTIONS: The effects of some drugs can change if you take other drugs or herbal products at the same time. This can increase your risk for serious side effects or may cause your medications not to work correctly. These drug interactions are possible, but do not always occur. Your doctor or pharmacist can often prevent or manage interactions by changing how you use your medications or by close monitoring. To help your doctor and pharmacist give you the best care, be sure to tell your doctor and pharmacist about all the products you use (including prescription drugs, nonprescription drugs, and herbal products) before starting treatment with this product. While using this product, do not start, stop, or change the dosage of any other medicines you are using without your doctor's approval. Some products that may interact with this drug include: pramlintide, dopamine agonists (such as cabergoline, pergolide, ropinirole), tacrolimus, tranquilizers (including antipsychotics such as aripiprazole/haloperidol, phenothiazines such as chlorpromazine/prochlorperazine), MAO inhibitors (isocarboxazid, linezolid, methylene blue, moclobemide, phenelzine, procarbazine, rasagiline, selegiline, tranylcypromine). Some medications may block the actions of metoclopramide. Tell your doctor or pharmacist if you are also taking anticholinergic drugs (such as benztropine, scopolamine, antihistamines such as diphenhydramine) or narcotic pain/cough medications (such as codeine, morphine). Since metoclopramide causes food and medication to move through your stomach more quickly, drugs that are absorbed from the stomach (such as digoxin) may not be absorbed as well. Drugs absorbed from the intestines (such as acetaminophen, levodopa, cyclosporine, alcohol, tetracycline) may have increased absorption. Tell your doctor or pharmacist if you are taking other products that cause drowsiness, including alcohol, antihistamines (such as cetirizine, diphenhydramine), drugs for sleep or anxiety (such as alprazolam, diazepam, zolpidem), muscle relaxants, and narcotic pain relievers (such as codeine). Check the labels on all your medicines (such as allergy or cough-and-cold products) because they may contain ingredients that cause drowsiness. Ask your pharmacist about using those products safely. This document does not contain all possible interactions. Therefore, before using this product, tell your doctor or pharmacist of all the products you use. Keep a list of all your medications with you, and share the list with your doctor and pharmacist. NOTES: Do not share this medication with others. Laboratory and/or medical tests (such as endoscopy for ulcer) may be performed periodically to monitor your progress or check for side effects. Consult your doctor for more details.